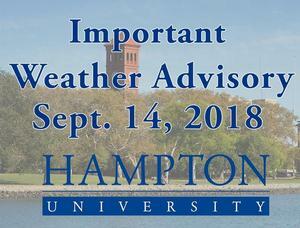 A number of Hampton Roads Universities closed their campuses based on the predicted impact of Hurricane Florence in this area. Hampton University instituted a voluntary evacuation and initially, some 1,000 of our students indicated that they needed housing on campus. However, only 33 students remained. In an attempt to accommodate students who could not go home or vacate the campus, Hampton University sheltered its students in Holland Hall, providing them with hot buffet style dining, large screened televisions, bedding, gaming systems, and a disc jockey. We are grateful that the University did not lose power and that the students who remained on campus were safe and comfortable. The Governor has lifted the mandatory evacuation. Therefore, the Administrative Council has decided to transport students back to their respective residence halls. All students may now return to campus. Classes will resume on Monday, September 17, 2018. The Administrative Council would like to extend a special thank you to Housekeeping, Buildings and Grounds, the Offices of Residence Life, Student Activities, the Counseling Center, the Health Center, Student Affairs, University Relations and Gourmet Services for accommodating our students.